Field testing of “PicoR” peat deposit monitoring device. – Ледомер. Георадар. Контрольно-индикационный прибор Пикор-Лед. Официальный сайт ООО "ФПК "ЭСТРА" производителя георадара Пикор. / News / Field testing of “PicoR” peat deposit monitoring device. Field testing of “PicoR” peat deposit monitoring device. 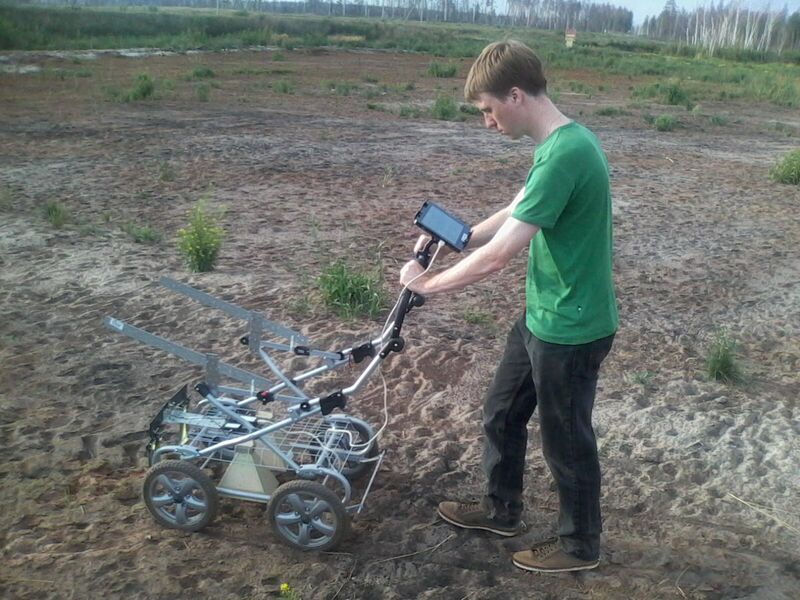 On July 25, 2012 at peat deposits in Olshany settlement, (which is located in Lukhovitsky district, Moscow region) “KBOR” representatives (UWB department) tested a prototype of a multifunction “Pikor” device for peat deposits monitoring. 2. The possibility of determining the presence of signal reflections from peat deposition layers with their detailed visualization was checked. 3. A series of tests was ran to use the device for peat fires prevention. 1. Before the prototype test, all aspects of peat deposits fire prevention at it’s early stages has been studied and it revealed, that the presence of voids and cavities within the whole structure of the peat layer on a mandatory basis indicates that there has been, or there is currently a fire inside the peat deposit structure. 2. The presence of voids in peat deposits after flooding is also a danger signal of current or possible subsequent fire, due to the fact that after certain thermal processes a waterproof layer, doped with a mass of peat tar and oil will be formed. It will have a relatively high temperature and it might evaporate an existing flooding. In such cases, it is necessary to monitor the presence of possible voids after the flooding. 3. When monitoring a peat formation it is important to visualize it’s thickness for statistical quantitative analysis.Such analysis will also help determine the degree of the fire consequences. 4.In regard to equipment aspect, during the field test it has been found, that it is preferable to use UWB Vivaldi antenna “Antrad-3” for mounting on mobile platforms (at a low overall height from the ground) , on the other hand, in a portable version, when the antenna is on a relatively large distance from the ground it is preferable to use UWB horn antenna "Antrad-6R". 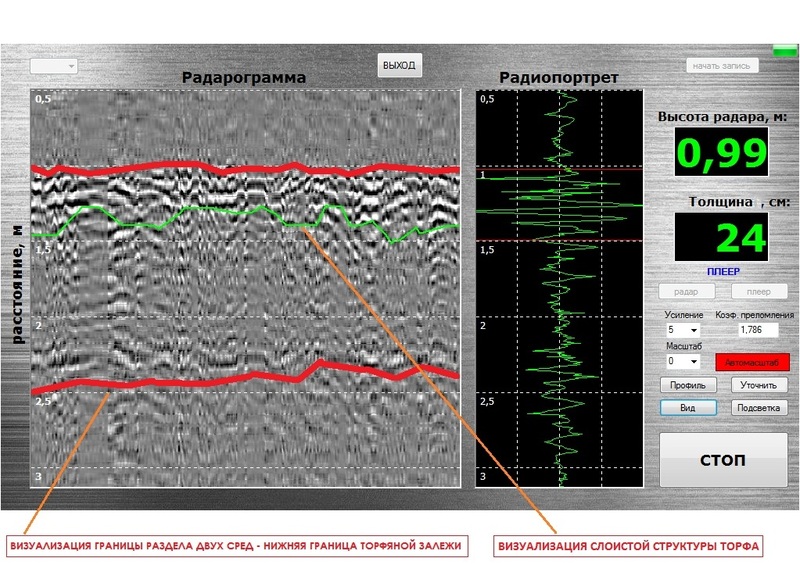 Software analysis quality depends on different types of antennas used, due to the signal shapes , reflected from the surface of the peat, may change. 5.It is possible and mostly preferable to integrate the prototype into an interactive information processing system with satellite navigation and tracking modules. A short footage was filmed during the field test.